The dust has settled and Nevada’s earth, admittedly a few months later, has been washed from the car. 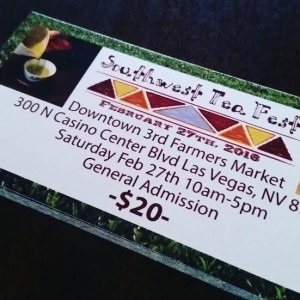 We were reluctant as we had such fun at the inaugural Southwest TeaFest in Las Vegas on February 27th. It was an eventful day where the 600+ visitors could walk through and enjoy the old Las Vegas subway station, which has since been converted into a marketplace. Yoga, Live music, food trucks, every type of tea, tea education, teaware, and everything else tea was available and on display at the festival. 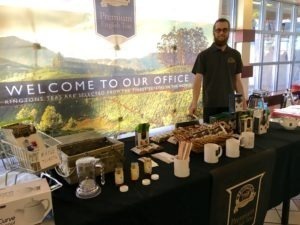 We were fortunate enough to take part in the growing tea community of Las Vegas, handing out samples of both our tea and honey, as well as holding a raffle, where the winners took home some coveted teaware. The people were lovely and truly made the event. Not just the attendees, but the volunteers and coordinators made it the success that it was. It was an honor and privilege to be a part of the SWTF2016. We had our own success as well, as we ran out of tea samples, and completely sold out of our honey! We’ll be better equipped next time, as we plan on doing it again in 2017, hoping to see you out there next year! This entry was posted in Uncategorized on 05/09/2016 by Michael Geddes.